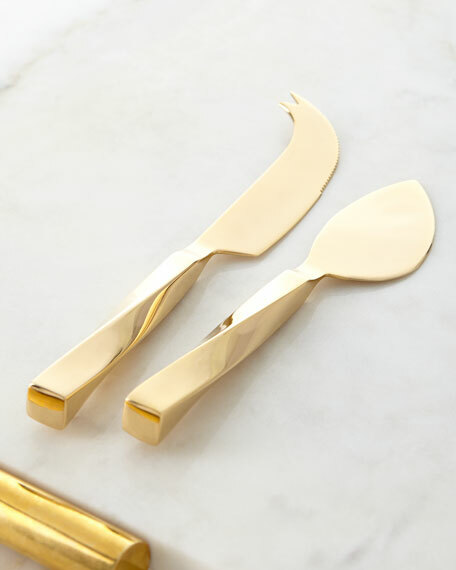 Handcrafted set of two brass cheese knives. Handcrafted Courtly Check?? boxed cheese serving set. Set of 3 includes one each as shown; each approximately 5.25"L. Hand-painted porcelain handles with gold lustre detail and 18/10 stainless steel implements. Being handcrafted, each will be unique and vary slightly. Hand wash. Imported. Handcrafted stainless steel cheese knife set. Clear enamel coating. Three-piece set. Pieces may vary due to the handmade nature of each product. Hand wash with mild soap and dry immediately. Approx. 7"-7.75"L. Imported.